Denae Frazier Studios is Excited to Announce that Star Wars Illustrated – The Empire Strikes Back has been Released! Denae Frazier Studios is excited to announce that Star Wars Masterwork has been released! 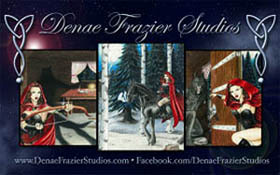 HAPPY NEW YEAR FROM DENAE FRAZIER STUDIOS! Happy New Year everyone! Thanks so much for all the support in 2014! We look onward into the light of the new day. May the new year bring happiness and prosperity to you and your family. May the Force Be With You Always.